Marie, Head of Marketing at Hopster tells us why she loves Humf. This post is part of our series on all things creative – whether it’s looking at kids cartoons, or brilliant games. Everyone at Hopster has their own favourites, and this time round, Marie, Head of Marketing, tells us why she loves Humf. One thing that has always fascinated me about Japan is how the concept of cuteness (or kawaii, as it’s called there) has transcended beyond childish fancy to a perfectly acceptable, and highly common, obsession. You need only watch a compilation of Japanese commercials to get a taste for how ubiquitous cute is. And of course, cute is a staple in anime, the Japanese version of cartoons (not to make the mistake of calling them kids cartoons!). I’m a big fan of all this. 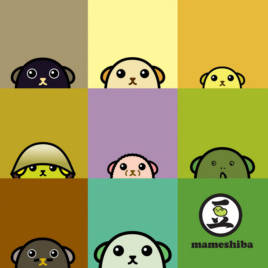 I mean, who wouldn’t be cheered up by the “beans of knowledge”, the Mameshiba, handing out bits of trivia, or a cat-eating Domokun? However, in “western” cartoons, cuteness often loses its edge, and becomes too saccharine. Or on the contrary, to appeal to adults, the makers try to build in clever dialogue that sometimes goes too far in the other direction (one amazing exception: Ben & Holly’s Nanny Plum!). Not so with Humf. He and his friends strike a lovely balance of believably naive interactions (which undoubtedly result in comical situations) and the natural scepticism and enquiring nature we all see and love in the young’uns. 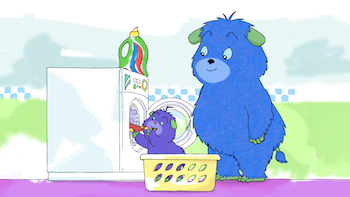 Every episode covers a familiar situation, which every preschooler will be able to relate to – whether it’s going to the park to play, watching telly, or hanging up laundry. 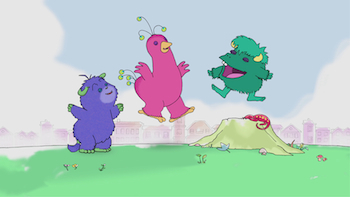 In fact, apart from the fact that Humf is a furry thing, his friends are a feathery and a hairy thing, the show could be set in any British town. In this familiar world, Humf does a great job of tackling a number of issues in a very straightforward, honest way – without patronising the viewer, or pressing the point too much. For example, in “Humf is a furry thing”, Humf wonders why he’s furry, why his friends aren’t, and whether it wouldn’t be much better to be a feathery, hairy, or even scaly thing. There’s an obvious message in here about accepting yourself as you are, and similarly, accepting others – but it’s so subtle and cutely down that I didn’t feel preached to, and neither did my preschool cousins. You’d think that telling everyday stories about a little monster and his friends should be easy to do, right? However, it’s the simplicity of the episodes that actually makes it harder to keep the show interesting. There are no car chases, grand conspiracies, or special superpowers to hide behind – it’s just Humf and his friends, doing their thing. Here’s where King Rollo’s execution really shines. The simple animation matches the gentle feel of the stories, and the British voice talent ranges from amazing to adorable. For any parents afraid of a creeping “Americanization” of their children’s accent from US kids cartoons, Humf is a godsend, with no exaggerated AWESOME’s, YEAH’s, or FANTASTIC’s in earshot. Caroline Quentin narrates the stories unhurriedly, and a particularly enjoyable touch is that whenever grown-up characters talk among themselves, all we hear is “bla bla bla bla” – which is probably precisely what preschoolers hear in real life! Humf deservedly got nominated for a Children’s Preschool Animation BAFTA in 2009, narrowly missing out to Ben & Holly’s Little Kingdom (which, by the way, is also on Hopster). Since discovering it through Hopster, I’ve spent a decent amount of time watching Humf for the fun of it – and I don’t have kids as an excuse! Want to see whether Marie’s got a point? Download Hopster and check it out for yourself!